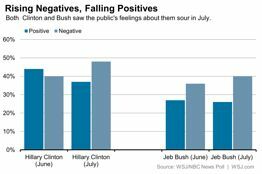 The bad news for Hillary Clinton in the new NBC News/Wall Street Journal poll: More Americans view her negatively than they did a month ago, revealing potential vulnerabilities for a general-election presidential contest more than a year away. The good news for her in the poll: Clinton continues to lead the Democratic field by more than 30 points, and the favorability numbers for two of the top Republicans are even worse than hers. Just 37 percent of all Americans have a positive view of Clinton, versus 48 percent who have a negative view (-11). Despite Clinton’s sinking favorability rating, she continues to lead the Democratic horserace by a wide margin. She’s the top choice of 59 percent of national Democratic primary voters, while 25 percent pick Sen. Bernie Sanders, I-Vt. They’re followed by former Sen. Jim Webb, D-Va., and former Maryland Gov. Martin O’Malley, who are tied at 3 percent each. That margin, however, is smaller than her 60-point national advantage over Sanders a month ago, 75 percent to 15 percent. If these poll findings persist (and they can change dramatically in over a year), they could indicate problems for Clinton in the general election. Democrats have hoped that any loss in support Clinton receives from the Obama coalition will be made up by more women voters backing Clinton. Now this poll shows a drop in Clinton’s support among white women. In June, 44% of white women had a favorable view of Mrs. Clinton, compared to 43% who didn’t. In July, those numbers moved in the wrong direction for Mrs. Clinton: Only 34% of white women saw her in a positive light, compared to 53% who had a negative impression of her, the poll found. Mr. Obama fared poorly with white women voters in the 2012 election, losing them to Republican challenger Mitt Romney by 14 points. Schultz has long been vocal about the role of government and its failure in addressing the nation’s pressing issues. In 2013, Schultz started a Starbucks-led petition to end the government shutdown, and delivered more than 2 million signatures to the White House in their “Come Together” campaign. While promoting his book For Love of Country, Schultz talked about the lack of leadership from the U.S. government and politicians: “The country is longing for leadership and for truth with a capital T,” he told Dowd in a New York Times story. The current success of Donald Trump in the Republican race raises the questions if an outsider such as Schultz could receive comparable support in the Democratic race. On the other hand, the Democrats might already have a potentially successful outsider in Bernie Sanders. Sanders has many of the benefits of an outsider, while also could be seen as a credible candidate for president after having served in Congress for twenty-five years, with a record including opposition to the Iraq war and the Patriot Act. Despite Clinton’s (diminishing) lead nationally, Sanders is now in a statistical tie with Hillary Clinton in New Hampshire. Victories in both Iowa and New Hampshire might quickly put an end to Clinton’s lead in the national polls.